The famous advice from Einstein to “Question Everything” is an important one. It forces one to think about the possible causes if any phenomenon, any action or any event that happens in our surroundings rather than accepting things as they are. It makes us more inquisitive and helps in learning more. It also helps in building a cognitive resonance with the harmonical nature. It helps in imbibing a basic level of intellect in any form of activity that we indulge. But there is a problem with the way questioning of things operates. Although predominantly cultural, a number of questions asked is depleting. Often meetings end with no one asking any questions or just a handful of people asking questions. And then there are situations where the mannerisms around asking questions are questionable. Quite often one of the reasons is questioning being loud, pompous, rude and as an attempt to demean the opposition. To keep the fabric of healthy intellect building in the world, it is important to understand and educate people on the ‘art’ of questioning everything. 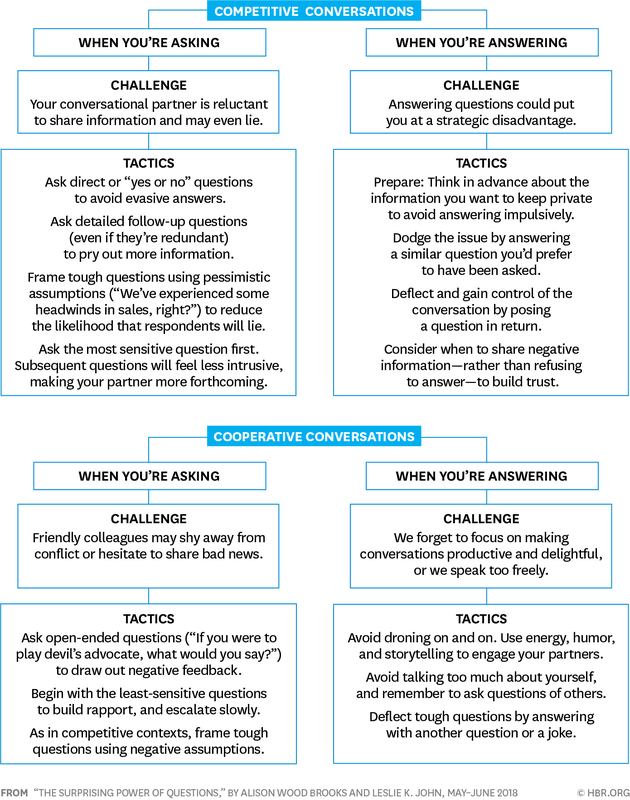 So let’s assess what are two constructs for conversation from questioning. This helps in building an approach for different types of question frames that exist to handle the situation. It also details on how one should approach the questioning part. Depending on what situation you are one should ask the question. With this clarity, do ask! Additionally, the way a question is asked also matter. These are driven by the need to lead to any action or in other words consequence. Positive Inquiry – We end questions with positive words like ‘right’ or ‘isn’t it’. This prompts the user to think about the veracity of the question. Generally, this prompts the next discussion point and helps in building an inquisitive conversation. Negative Inquiry – These are typically questions that end with negative words like ‘correct’ or ‘is it’ etc. These do not generally yield a conversation but are interrogation type of questions. These help in meeting an objective. Again, this is something that one should look at to close the inquiry loop based on what do you want to accomplish from the conversation. So while we strive to ask questions to make the world a better place with healthy conversations leading to more knowledge and enlightenment of people, it is important to be aware of the different questions based on what is our purpose for it. Think and then ask so that you think again – leading to a fruitful intellectual growth. Inspired by the HBR article here.